Spring into the future with Natterjacks! If you’ve felt the earth move under your feet at our Bournemouth surgery in recent weeks then fear not – you are not having a ‘moment’ or in the midst of a freak earthquake, rather that we are in the process of a major refurbishment and expansion project to provide the four pawed members of your family with more space and new hospital and operating facilities to ensure we continue to stay at the very top of the profession. The year ahead will see further major investment at both sites – perhaps most excitingly of all will be the introduction of a top of the range CT scanner in Poole. Costing several hundred thousand pounds, We will be first clinic in Bournemouth, Poole and Christchurch to have this technology which will assist in the diagnosis and management of a wide range of conditions which traditional scans and x-rays cannot detect. The intention is to make this available to all pets in the area on an outpatient basis. Poole will also see the arrival of a new digital dental suite and an advanced ultrasound machine, with Bournemouth benefiting from new video-endoscopy facilities. Both sites will also have upgraded laboratory machines and new inpatient care and monitoring equipment. It has been a busy few months already as our magnificent team continues to grow and grow. The Poole clinic has really exploded since Christmas under Julian’s command and the addition of charming Marcin and now Hannah to the veterinary team have added strength and depth in both surgical and medical disciplines. We have also recently added the lovely Anita and Lucy to the nursing and support teams. In Bournemouth the veterinary squad has been strengthened by the introduction of fabulous Fran whilst the delightful Laura, Beth and Sophie have excelled in their nursing and reception roles. The search continues for yet more great people to join the team to take full advantage of our new facilities and ensure that we can continue to provide our expanding family with the same high level of care and service that you have come to expect from us. 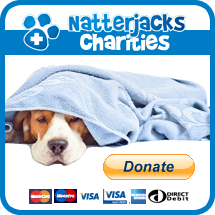 You may also have seen in the local press earlier this year that we welcomed Vets2You into the Natterjacks family and this service will bring a whole new dimension to our practice – see here for more info: www.natterjacksvet.com/vets2you. This unique service will be operated by a super team comprising vets Sarah and Louise alongside nurses Lucy and Natalie. Finally we have been so busy that we completely missed our 6th Birthday last month – it is amazing how far we have come in such a short space of time and none of this would have been possible without you so thanks for helping to make our dreams a reality. We are immensely proud to be trusted with the care of your loved ones and proud of the fact that we have been able to bring the very cutting edge of the profession to your local, family vets 🙂. 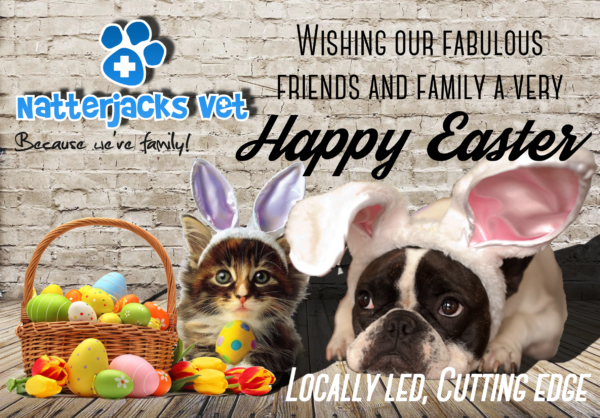 Have a great Easter and lets hope the weather soon matches the bright and sunny year ahead that we have planned here at Natterjacks!